I’m freshly back from a trip to Norway, and I may have eaten my body weight in cinnamon buns. They were completely different to the ones I’m about to post about, but I thought it was relevant. I’m going to be trying to find a recipe for one of them soon, so keep your eyes out for that. In the meantime, this is an updated recipe to something I baked a year ago, and while pumpkins are still in season (yup, they don’t disappear after Halloween) I felt that it was a great time to stick this together. The cinnamon bun recipe itself is the same as the first one, I just didn’t roll it as thin and changed the glaze, from the maple to something slightly different. I stirred through a decent helping of the new Baileys Pumpkin Spice to give it a bit of a kick. The pumpkin spice, unsurprisingly, goes well with the pumpkin in the buns and the cinnamon that’s running through them. It’s all been a bit quiet on the recipe front this last month. Having no internet at home hasn’t really helped with this. I’ve been doing a lot of cooking and slightly less baking. But I moved back up to Walthamstow this week so I’ve got internet back now. I’m going to try and make up for my lack of food posts with my next Top 3 In London (Pizza this time), and a bunch of spring friendly recipes. I want to “master” bread this year as I never make enough of it. However this month I’ve made a couple of new bits and pieces. Including this Chai Latter Loaf. 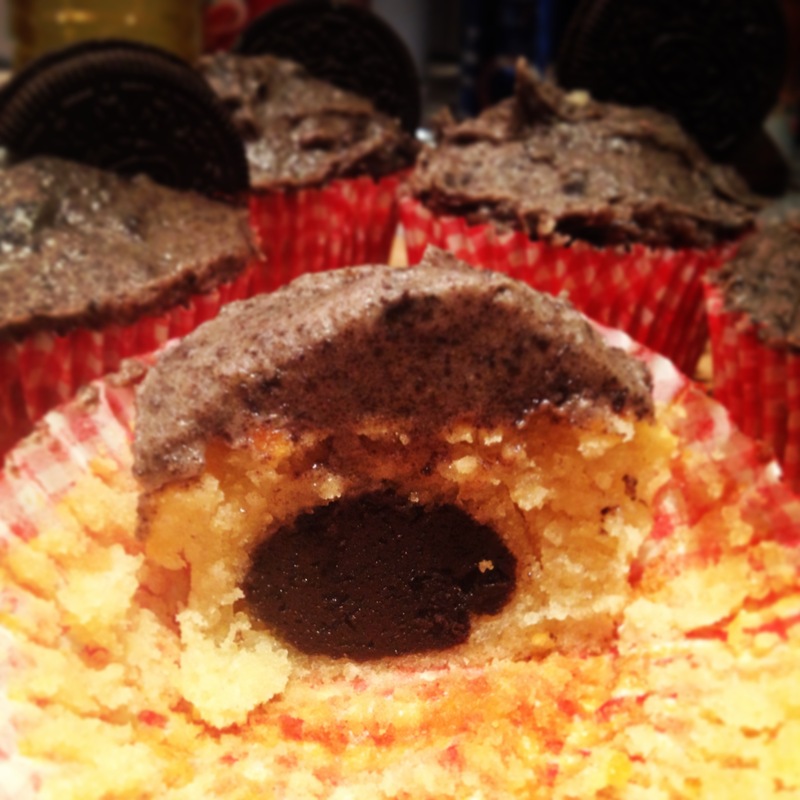 You’ve all seen my Oreo Truffle recipe. Something quick and easy that tastes incredible. Well what happens if you take that, and put it inside a cake? 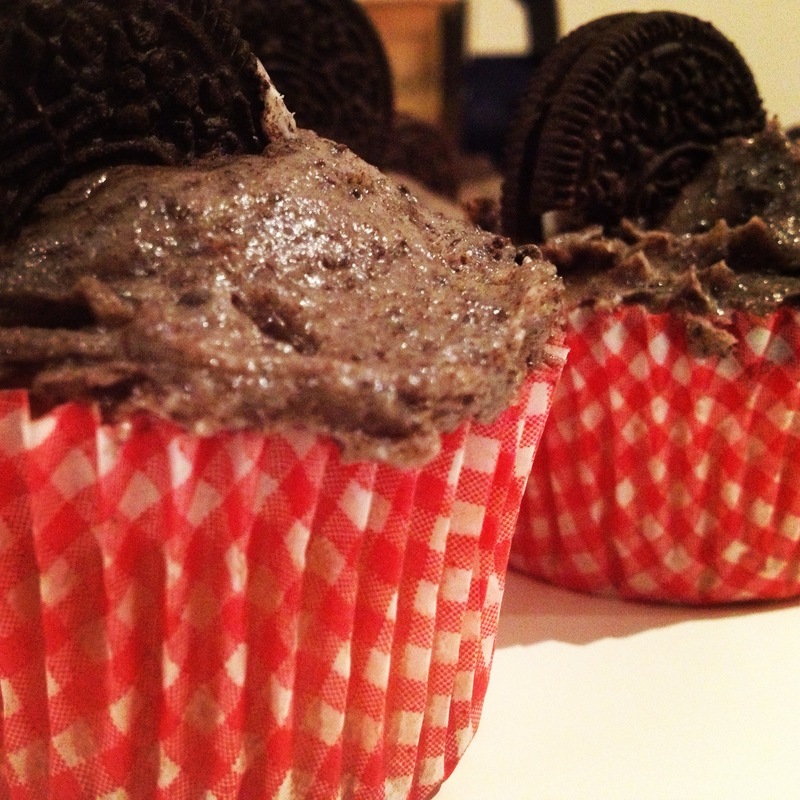 I already had a recipe that I’d used a few times for gooey centred cupcakes. It works great, rising up around the cream cheese filling. I had a bit of a brainwave to take the Oreo truffles I loved so much and put them in place of the chocolate/cream cheese filling from that recipe (I of course Googled it and realised that I wasn’t the first one to think of it). 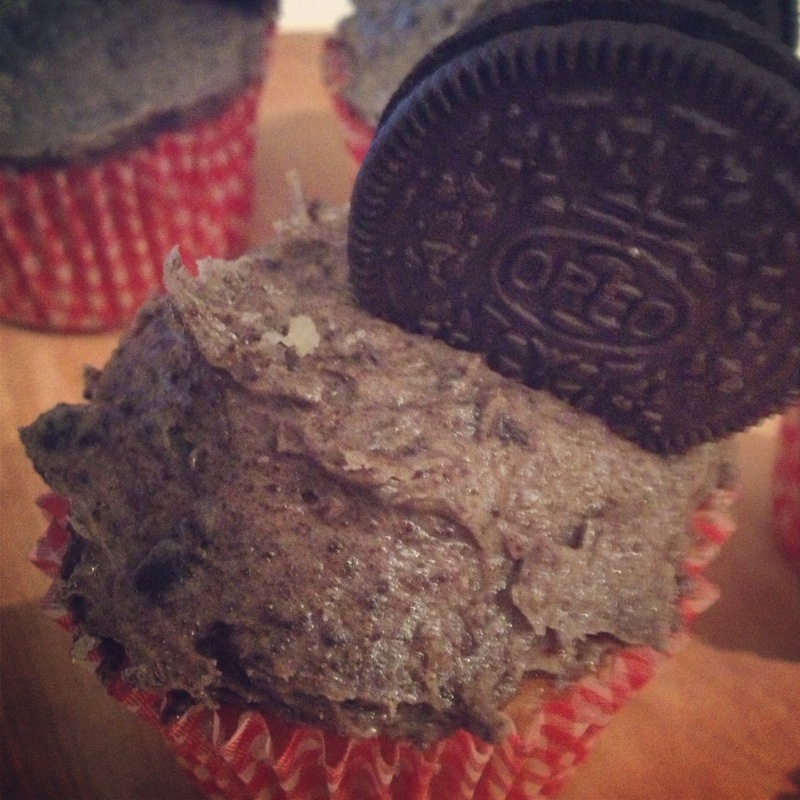 These cakes are decadent and once they’ve been topped off with a wonderful Oreo frosting they just taste incredible. Coupled with the look of surprise on most people’s faces when they reach the truffle centre. 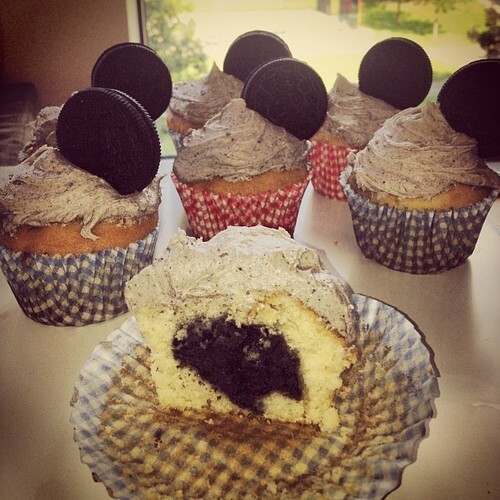 Oreo Truffle cupcakes are born. Start with the truffles. Obliterate the Oreos, mix in with the cream cheese. Form in to balls and place in the fridge to chill while you make the batter. Preheat the oven to 180°C (160°C fan) and line your muffin tin with cases. Mix together the “dry” ingredients; flour, salt, baking soda (and cocoa powder if using). In the bowl of your electric mixer cream together the butter and the sugar. Mix in the eggs, buttermilk and vanilla extract. Then, alternate between adding the flour and the hot water in three stages. Starting and ending with the flour. Beat on a medium speed until smooth (this can take a few minutes). Divide the batter out between the cases. The cases should be filled to around ⅘ of the case. 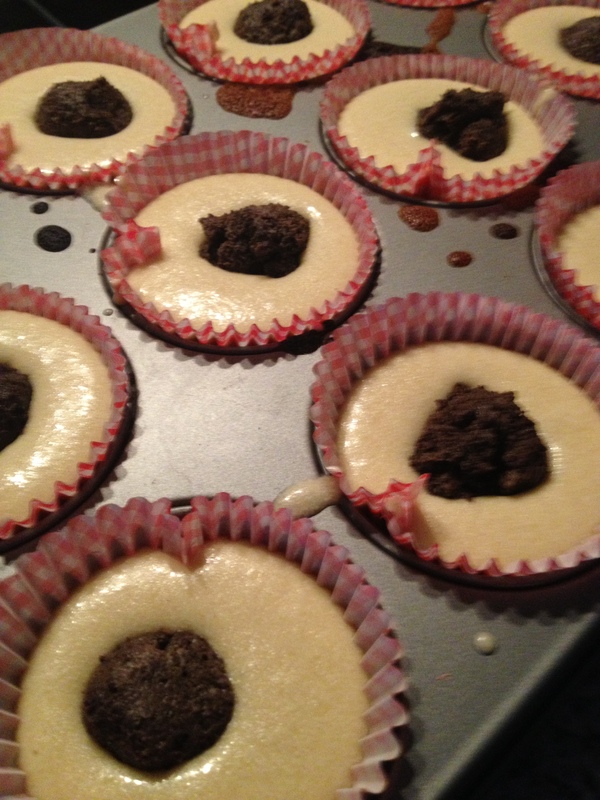 Drop a truffle into the centre of each cake. They are fairly heavy, so will probably sink towards the bottom, but make sure you don’t push them. Place in the centre of the oven and bake for 20-25 minutes, until they have risen and a toothpick inserted into the centre comes out clean. While they are cooling, make the frosting. Cream together the butter and the powdered sugar. Add the cream cheese and Oreos and beat together. If you want to thicken it up, add more powdered sugar and more butter if you want it thinner. Once the cakes have completely cooled, ice them with a knife. Decorate with remaining Oreos.